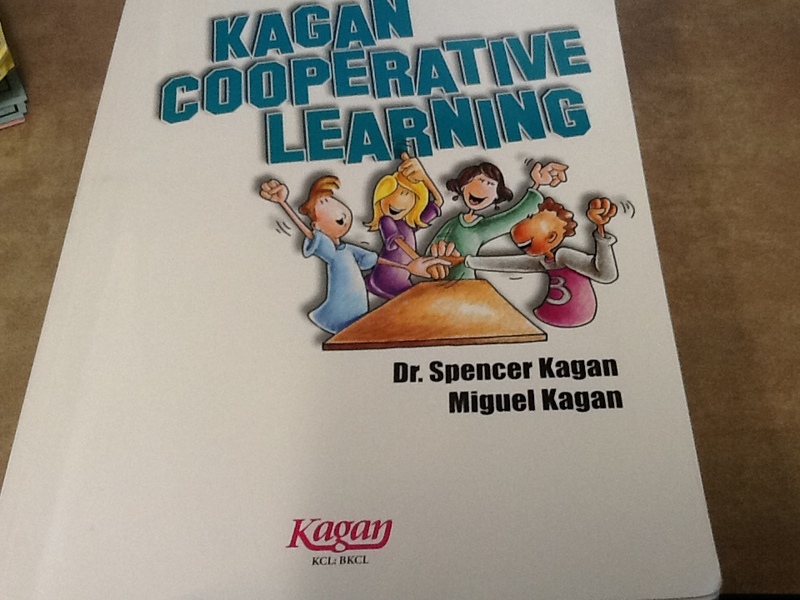 Several years ago, for about 18 months, a wave of professional development came through our school that focused on Kagan Cooperative Learning Structures. We got trainings, and books, and flip cards filled with structures with cute little names on them. And it all seemed very… I don’t know… complicated. Now, Cooperative Learning is a fantastic model, especially if the contexts are rich enough to make the interactions necessary. However, the Kagan model has changed the game a little bit, and I’m not sure if it is for the better. It seems to me that there are some problems with looking at cooperative learning in this way. To illustrate, I’ll use an example from my class. 1. I needed a good, quick, formative assessment of what my classes knew about right triangle trigonometry and what they didn’t. 2. To get that, I needed to engage them in a variety of simple problem-solving activities. They were NOT going to engage sitting in their seats doing a quiz. Sitting still wasn’t going to work out today. So, I took the different types of situations I wanted, created nine different problems, printed them on sheets of paper and taped them around my room. The I grouped the students and sent them around the room to solve one problem every 2-4 minutes and then report back what they were confident with, so-so with, and confused about. I still needed to assess them. 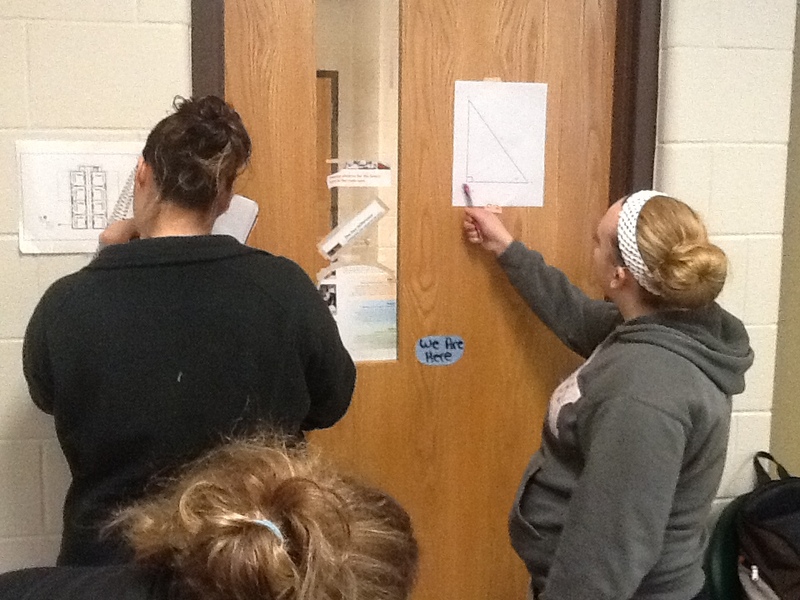 According to Kagan, I used a Modified Gallery Walk with a possible Rally Coach with a likely Carousel Feedback. It was effective because it followed the PIES framework of Positive Interdependence, Individual Accountability, Equal Participation and Simultaneous Interaction (Kagan, 2009). 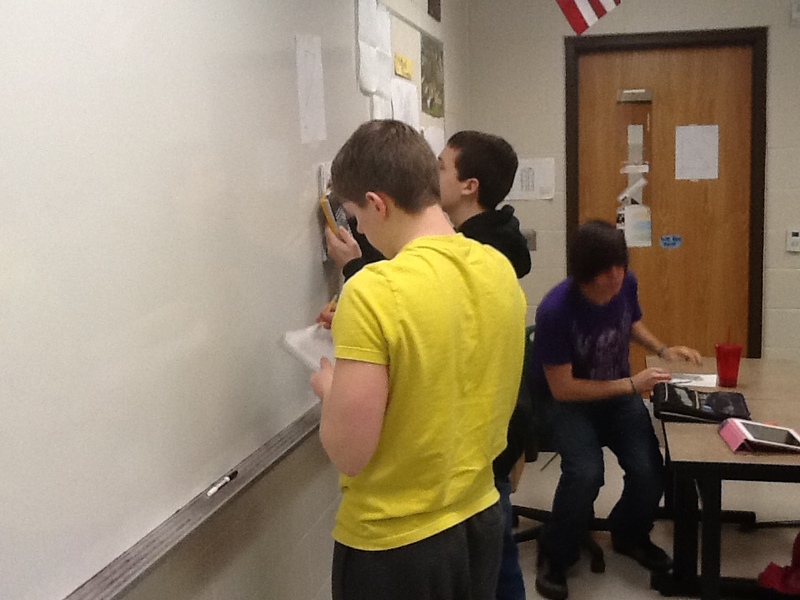 So, I taped the problems to the wall one question and a time and sent them around the room. I don’t want to sound like I am making fun of Kagan. I’m not. 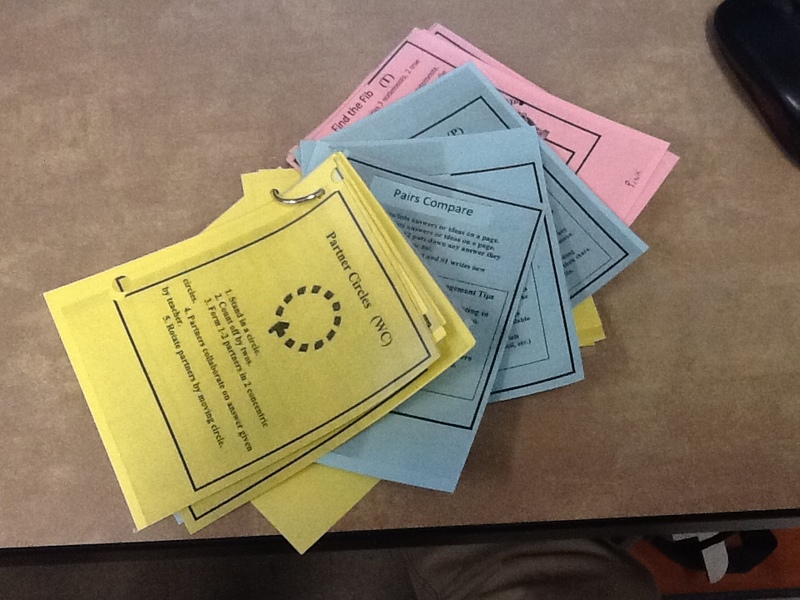 A ton of R & D went into creating the program, the vocab, and the resources. But, at least in this case, we’ve taken a fairly simple principle of knowing what your class needs and being flexible and WILDLY over-complicated it with a ton of gimmicky-sounding vocabulary. But teachers need to have a variety activities to use in order to be flexible, right? Without programs like Kagan, where do they go to get them? How about the expert down the hall? We as a teaching culture have lost the value of the classroom observation. In the schools I’ve been in, teachers hardly ever get a chance to see each other teach. It could be that this is what has caused the need for books, seminars, and flip-cards. We aren’t letting our teachers share. Seeing what the masters of the craft do when there are 25 real, live students in their room is a whole different experience… a powerful experience… an experience that we are leaving on the table. I have been mentored by three different teachers. I was NEVER directed by my principal to observe them teach. I have mentored two different teachers. I had to ask special permission, and make all the arrangements in order to observe them or to have them observe me. It shouldn’t be this way. When we over-complicated things, they become confusing and overwhelming. We’ve been forced into this by not letting our novice teachers watch the master teachers at work. It seems reasonable to assume that the example set by the expert next door will spread good practice a lot farther than the 400-page book that never gets read. The final class of my program (Western Michigan University calls it a “Capstone Experience”) is forcing some effective reflection on the previous 10 courses that I’ve taken and the way that they will impact my leadership practice in the education industry. I am beginning to find that there is no substitute to having reflectively considered and articulated my educational philosophy. Really, it is a chance to formally decide what is important to me as an educator. There are many, many important aspects to education. But, I don’t know if I can focus on more than a handful. Schools give educators a lot to think about. There must be a limited number of targets. For example, Dr. Willard Daggett lays out 12 guiding principles. So, I have spent the last three years listening, reading, discussing, writing, and considering what my targets might be. How can I narrow down to the limited few targets? What do I think is important? It’s the same idea as a business creating a mission statement. As an educator, I’m going to do a lot of things, but among those things, THESE things will receive my laser focus. Oh, that isn’t to say that items left off my target list aren’t important, but it seems like if I these essential few are handled properly, the rest will likely fall into place. 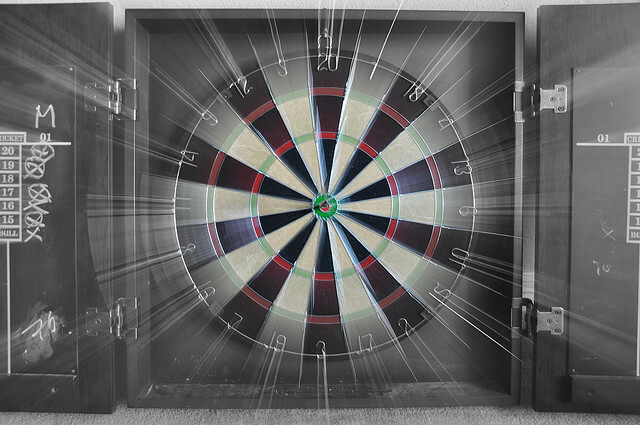 So, what are my targets? Well, it seems they are forming around three major areas. These are targets that can be applied as a teacher or as an administrator. I hope to continue to develop these ideas. I hope to keep learning. As I learn, I may need to adjust, but one thing that I am sure of. There must be targets. There mustn’t be too many of them. For now, these are mine. The idea is becoming more commonplace: giving math students regular chances to be creative in the process of solving problem has many benefits to their learning. Less common is the connected idea: giving students regular chances to be creative in the process of solving problems has many benefits to MY learning. 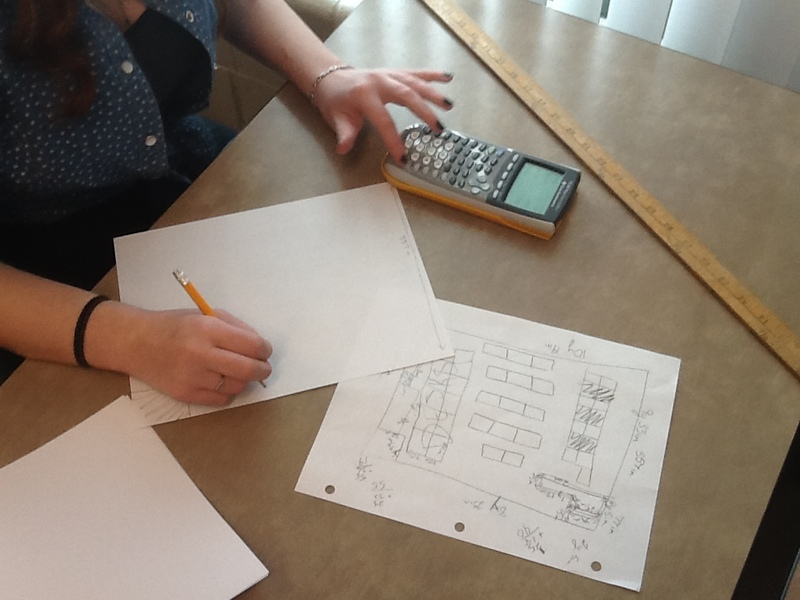 Case in point: Today, my students worked on the Scale Model Floor Plan Problem, which required them to create a scale drawing on the classroom. Fairly simple instructions, right? And watch what they show you. 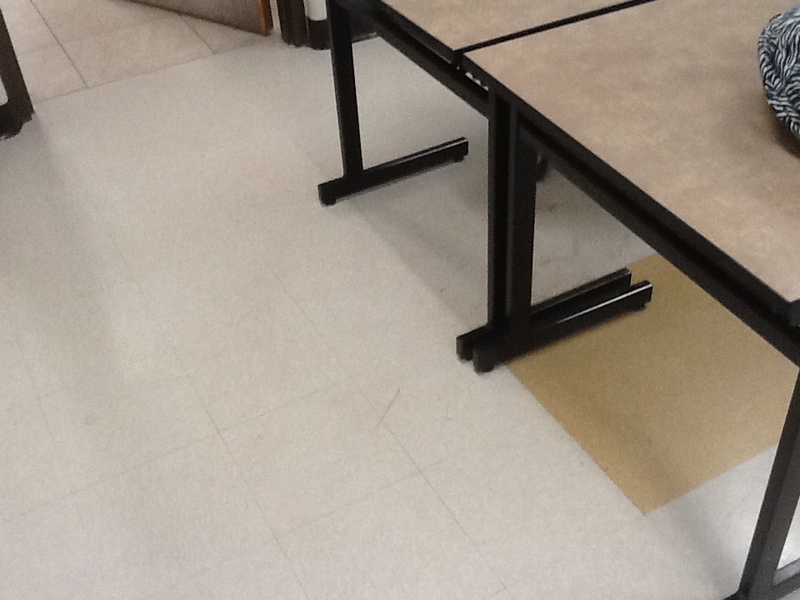 The tiles potentially make my floor a giant coordinate grid. Right away, they all reached for the yard and meter sticks, despite the fact that our chairs and desks are all sitting on one-square-foot tiles. Few groups thought to use them as a reference. The “hold-your-finger-there-while-I-move-the-yard-stick” method was far more common. These two prefer the meter stick. Cinder blocks create grids on the walls. Counting the blocks seems more accurate and easier on the back and knees. Please understand, my goal isn’t to poke fun at these students. But let’s examine this. 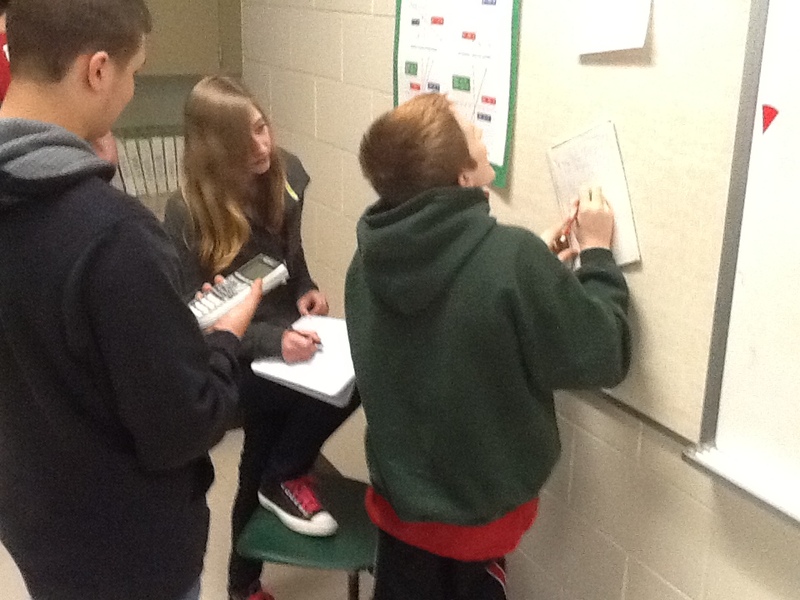 What would make a group of students choose a more difficult method of solving a problem? I don’t think it is a lack of concern for quality. The drawings they produced suggest that quality matters to them. I don’t think it is poor math skills. On the contrary, there are some very successful and highly-achieving students who worked on these scale drawings. “There is a pervasive public view that different teaching pedagogies influence the amount of mathematics knowledge students develop. But students do not only learn knowledge in mathematics classrooms, they learn a set of practices and these come to define their knowledge. If students ever reproduce standard methods they have been shown, then most of them will only learn that particular practice of procedural repetition, which has limited use outside the mathematics classroom” (pg. 126). I unpack this idea in slightly more detail in a previous post, but bottom line, the hidden curricula of our math classes seems a likely culprit. According to most math curricula, this task requires multiplication, use of a ruler, and some understanding of proportional reasoning. But, it also requires flexibility, resourcefulness, the ability to predict, and the ability to consider multiple methods. Which unit did we put those skills in? Which prerequisite course did we expect the students to pick up those practices? Some methods require more number-crunching than others. Bottom line: We need to think beyond what math content we are expecting and consider the type of experiences we are giving our students with the content. Open, flexible, contextual problems yield knowledge that can be used in open, flexible, contextual situations. Procedural, specialized, algorithmic problems yield knowledge that can be used in procedural, specialized, algorithmic situations. What kind of students do we want walking across the stage at graduation? Boaler, Jo (2001). “Mathematical Modelling and New Theories of Learning.”Teaching Mathematics and Its Applications. Vol. 20. No. 3, p 121-128.